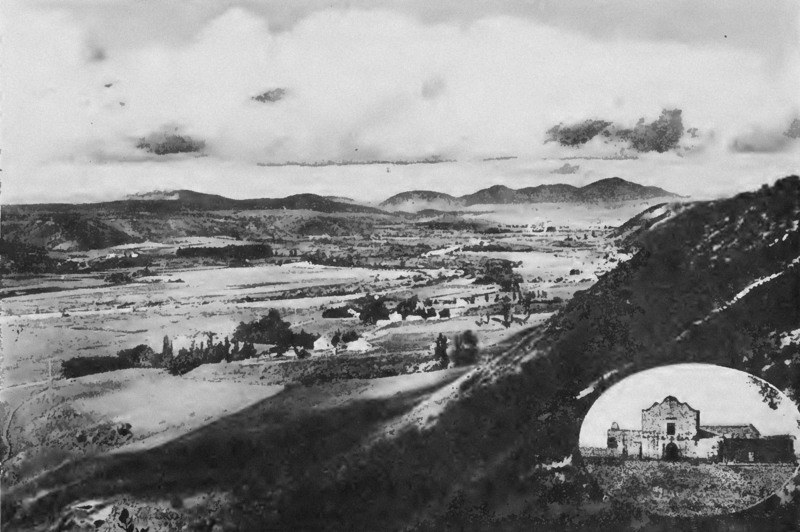 “Overlooking Mission Valley,” or “View of Mission Valley” were common selling points found in realty ads in San Diego papers from the 1880s to the 1950s. “Good bottom land” was a similar selling point, especially in the late 19th and early 20th centuries. This was the valley that Arthur Ribble called “a garden of small farms and dairies” in his 1990 book, Yesterday in San Diego. Ribbel was a columnist for San Diego newspapers from the 1930s to the 1970s with a lifelong love for San Diego and for Western history. His book, published shortly before his death, included a chapter called “Bygone Mission Valley,” in which he recalls “a tranquil and beautiful checkerboard of well-manicured truck farms” producing crops ranging from alfalfa, corn, cabbage and beans to hogs and dairy products. “Many oldsters recall hunting rabbits, quail and dove on the floor of the valley,” wrote Ribbel. The building of motels on the western end of the valley in the early 1950s was a portent of change that accelerated in the middle of the decade with the erection of a new minor league baseball stadium and, in 1958, city approval for the construction of a new shopping center by the May Company. The transformation from Mission Valley to Fashion Valley had begun in earnest.